Having a properly aligned cartridge not only reduces distortion, but also insures the least amount of damage to the vinyl's grooves. What's cool is that we're giving them away for free!!! Once you receive the Protractor it's easy to use. Simply loosen the bolts that connect your cartridge to your tonearm. 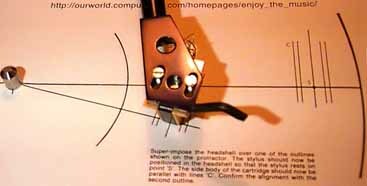 First, place the Protractor on your turntable with the hole on the protractor firmly into the spindle hole. Then simply align the cartridge so that it's in the center and parallel with the parallel lines. Once the needle is precisely on the dot in the center of the parallel lines you have an aligned needle. Verify your alignment with the second set of parallel lines. Once you are certain your needle and cartridge is aligned correctly, carefully tighten the bolts which hold your cartridge to your tonearm. That's it! Easy huh? (a legal sized envelope works fine).